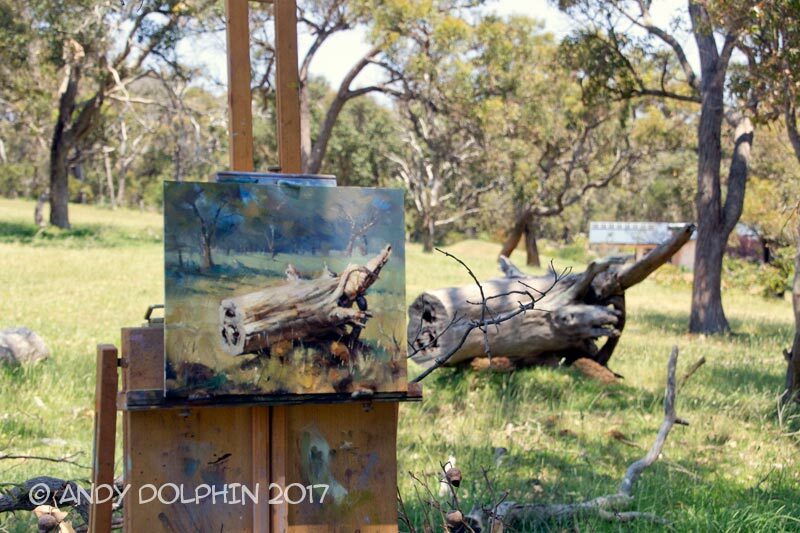 I have been out and about with the Albany Plein Air Group in recent months. 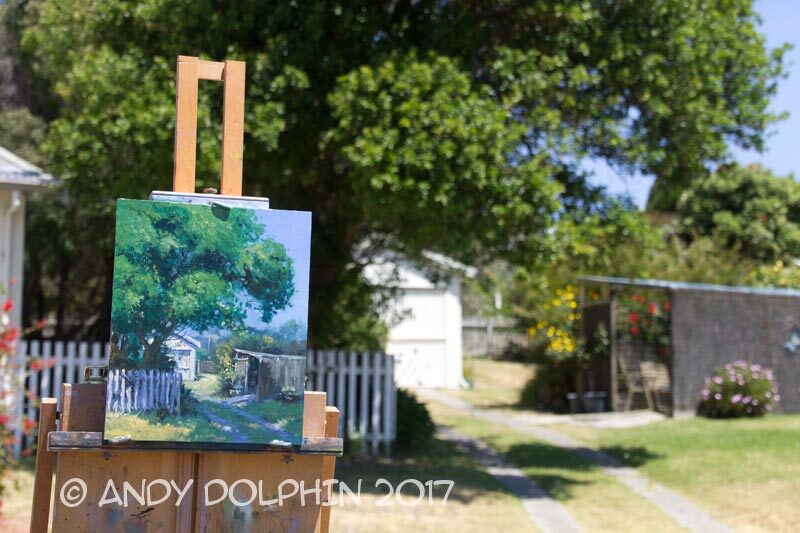 Here’s a painting I did a couple of weeks ago in the Albany Whaling Station precinct. And here’s the location shot. 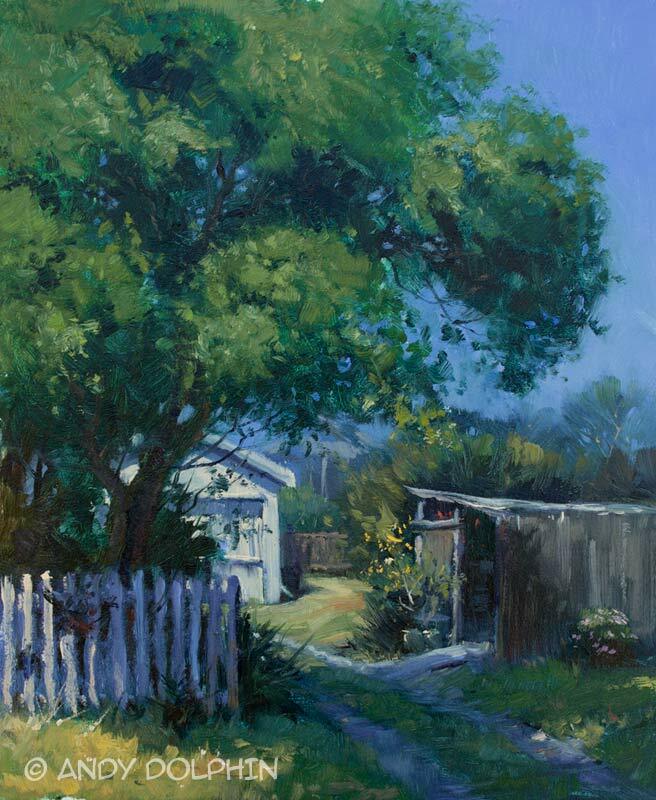 It was a beautifully sunny morning – hot in fact – and this white garage contrasted against the dark shadows of the foreground tree caught my eye. The white picket fence in shadow added more interest. There’s a little over two hours work in this one – longer than I usually like to spend on a plein air piece – and all the shadows shifted dramatically from start to finish. The viridian green got away from me a little but I hardly noticed it while standing out in the full sun painting. Still, I’m pretty happy with it and I think I will do a studio version of it one day. And here’s one from today’s visit to Wignalls Winery. I’ve always wanted to do a painting like this but have usually dismissed similar subjects in favour of more “normal” paintings, like views across the landscape. 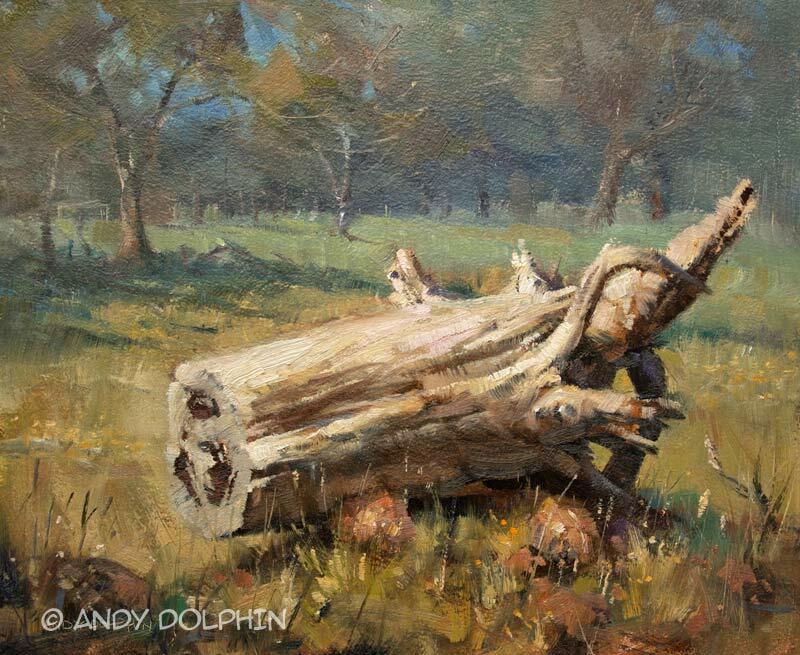 But today, this fallen stump presented such harsh contrasts of light and shade, I decided I had to paint it. I left viridian off the palette for this one and chose to mix all greens using combinations of cerulean, ultramarine, lemon yellow, cadmium yellow, yellow ochre, burnt sienna and cadmium scarlet – though not all at once. With summer just a week away, the paddocks are losing winter’s acidic greens and taking on some warm earthy tones, so the viridian may get a rest for quite a while. Thanks again to Albany Plein Air Group for inviting me along, and to Wignalls for allowing us to paint there.